I was quite excited to find some smoked mozzarella at the local farmers’ market this weekend. I’d been pondering what to make for this month’s Cheese, Please! Challenge but, although I love smoked cheddars, they were leaving me a bit devoid of inspiration. The mozzarella immediately made me think of bread but I wanted to do something a bit different and that’s when I thought of campfires and cowboys and cornbread. All very smoky indeed. 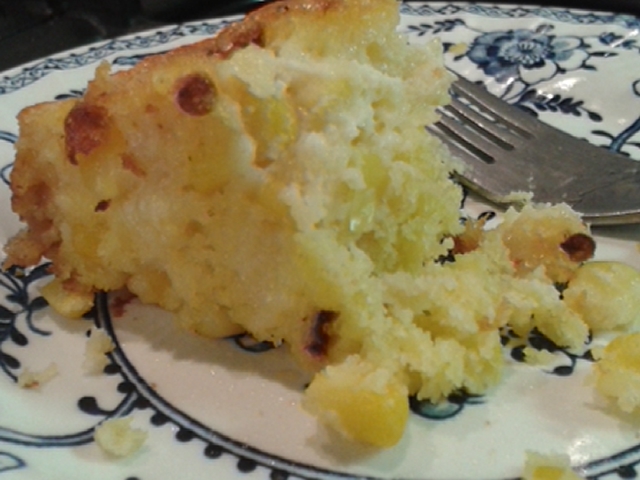 I’d never made cornbread before so didn’t quite know what to expect but this was nice, the sweetcorn giving it a slightly sweet edge and the chipotle pepper giving it just enough smoky kick to keep small children away without blowing your head off. The chunks of mozzarella ooze out stretchily every now and then. Camping trips are a rarity in this house but I could imagine cooking this and eating it around a campfire with some baked beans, possibly playing the harmonica or ukelele (obviously not in November though). The cheese is made by Green’s of Glastonbury and traditionally smoked over oak by Capreolus Fine Foods, an artisan smokehouse in Dorset. It has all the creamy texture of a mozzarella but a very smoky flavour. Here it is, with a criss-cross bottom, I imagine from sitting on a grill over the smouldering wood-chips. 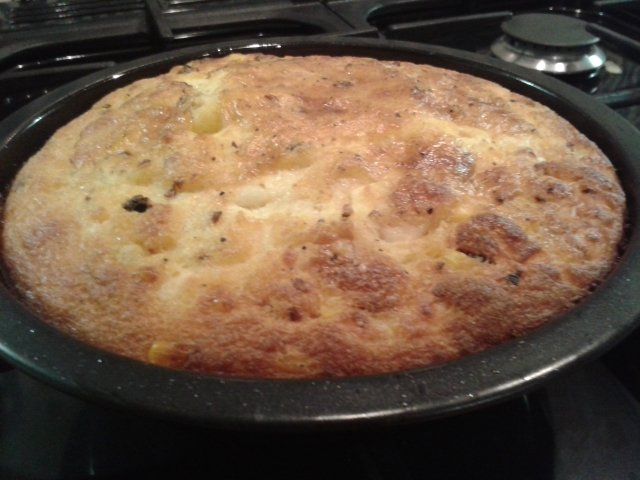 I used this recipe in The Guardian for the basic cornbread ingredients and quantities. Preheat your oven to 220˚c / 200˚c fan-assisted / Gas Mark 7. Dig out a baking pan (mine was round with a diameter of 9 inches, about 1.5 inches deep). 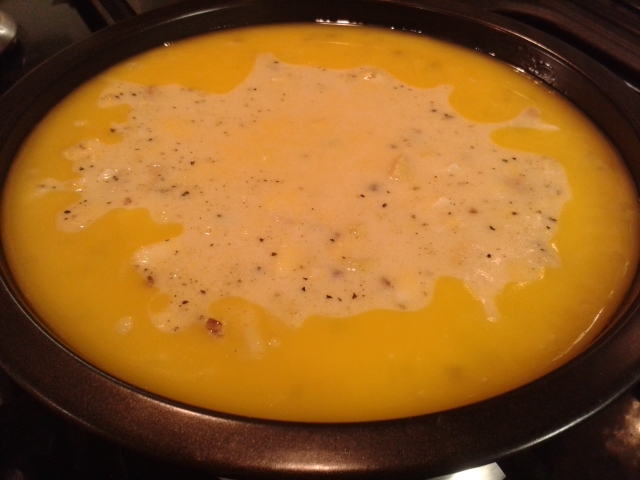 Mix the milk, eggs and oil together well and then add the sweetcorn, chopped pepper and cheese and combine. In another bowl, add the baking powder, sugar, salt, cornmeal and flour and mix together well. Add these dry ingredients to the wet mixture and combine – but don’t overwork it too much. Put the butter (about two large knobs) in the baking pan and put it in the oven until the butter has melted. Remove it (don’t forget the oven gloves – it will be hot already!) and quickly pour in the batter. Put it back in the oven and bake for 25-30 minutes until the top is golden and firm. 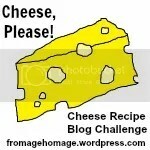 I am also adding this recipe to the Shop Local Blogging Challenge hosted by Elizabeth’s Kitchen Diary, as I bought the cheese from my local farmers’ market in Balham. And I’m adding it to The Spice Trail, a new challenge hosted by Bangers and Mash. Brilliant idea. Wish I could have some right now! The rest of the family aren’t keen, as it’s too spicy, so I am gallantly (still) eating my way through it. Absolutely love smoked mozzarella and this looks very good! 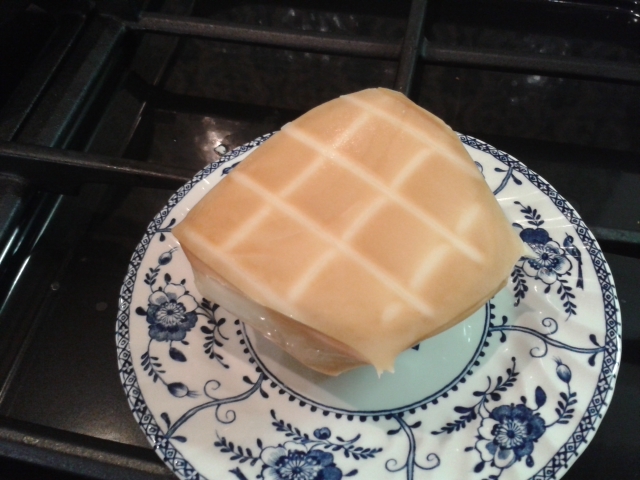 It was my first try of smoked mozzarella – really good combination of flavour and texture. Ooh sounds yummy, I love cheesy recipes! Oak smoked mozzarella sounds divine and I love the idea of including it in cornbread. Thank you for sharing with #ShopLocal! My pleasure 🙂 I’d been meaning to cook with something from my local Farmers’ Market for this for ages so glad I finally got round to it.